This chapter explores the impact that President Kennedy’s assassination had on Theodore Sorensen. It examines Sorensen’s attempt to eulogize the late president in his book, Kennedy. 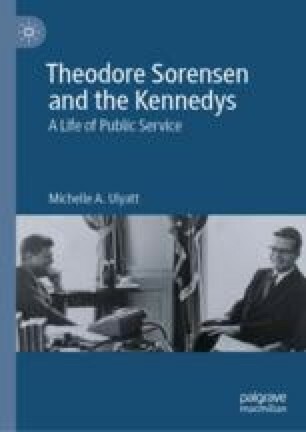 The chapter then charts Sorensen’s return to political life with his involvement in the presidential campaign of Robert F. Kennedy, which provided an opportunity for him to express his opposition to President Lyndon Johnson’s foreign policy approach, particularly in Vietnam. The chapter explores how Sorensen’s work with Robert and Edward Kennedy and his involvement in establishing the John F. Kennedy Presidential Library and Museum helped inform the public’s understanding of President Kennedy’s legacy. Ulyatt argues that these pursuits also allowed Sorensen to continue to fulfill his public duty by maintaining a role on the national political stage. Barthelmes, Wesley. 1969. Interview by Roberta W. Greene, 20 May 1969. Robert Kennedy Oral History Program of the John F. Kennedy Presidential Library and Museum. https://www.jfklibrary.org/Asset-Viewer/Archives/RFKOH-WB-01.aspx. Newfield, Jack. 2004. “RFK Remembered, April 25, 2004.” John F. Kennedy Library Forums. https://www.jfklibrary.org/~/media/assets/Education%20and%20Public%20Programs/Forum%20Transcripts/2004/2004%2004%2025%20RFK%20Remembered.pdf. Smothers, Ronald. 1990. “After 26 Years, a Lawmaker’s Fight Is Recognized as a Profile in Courage.” New York Times, May 28. https://www.nytimes.com/1990/05/28/us/after-26-years-a-lawmaker-s-fight-is-recognized-as-a-profile-in-courage.html. ———. 1963. “Transcript of telephone conversation between Theodore C. Sorensen and Lyndon B. Johnson, June 3, 1963.” Theodore C. Sorensen Papers, Presidential Papers, Subject Files 1961–64, Civil Rights Legislation 1963, Sorensen-LBJ Phone Conversation. John F. Kennedy Presidential Library and Museum. https://www.jfklibrary.org/Asset-Viewer/Archives/TCSPP-030-013.aspx.